Heading out of town this holiday season to spend time with family and friends? Just heading on a winter vacation over the holiday break? 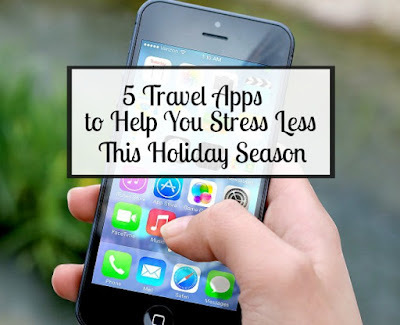 If so, traveling during this time of the year can be stressful, but it doesn't have to be if you utilize these 5 Travel Apps to make things easier. As always, it's best to do as much research and planning ahead of time, before leaving home. The following tips are courtesy of TravelCar.com, the global leader in airport parking and car rental solutions for travelers. 1. TravelCar – Travel to the airport can be hectic, but it doesn’t have to be. With TravelCar, you pre-book your airport parking space for up to 70% less. Stress less and save money by pre-booking your airport parking with TravelCar. 2. Hopper – Hopper analyzes billions of airline prices daily to predict how prices will change and tells you whether to buy or wait. Save up to 40% on your next flight. 3. Lounge Buddy – With LoungeBuddy, all travelers can access to any of the airport lounges in their network — no memberships, elite statuses, or first class needed. 4. Sanctifly – Sanctifly helps travelers seeking wellness get access to airport hotel gyms, pools, spa facilities and more, without having to book a room. 5. Be Relax – With more than 52 spas at airports around the world, Be Relax helps make traveling more pleasant by creating a specific relaxing and beauty airport lounge where you can chill before taking off. In addition to these Apps you should always pack at least 2 phone chargers and an extra power charging bank. If one of your chargers should quit working, you'll have a back-up on standby. Keep your phone charged up, so that you can access travel information while on-the-go.